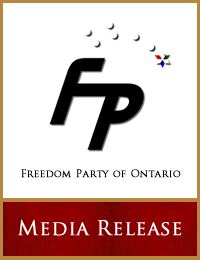 Published by later-to-be Freedom Party Action Director Marc Emery, nine issues of the Downtown London Metrobulletin were published from 1981 to 1982. Emery launched the Downtown London Metrobulletin after leaving the broadsheet newspaper he founded in 1980, the London Tribune. Emery and fellow investor/writer Robert Metz left the London Tribune over its editorial policy: Emery’s vision of a hard-hitting newspaper was trumped by other investors, who did not want their friends and business connections to be criticized in the paper. 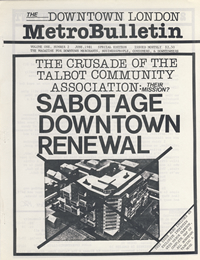 The Downtown London Metrobulletin was succeeded by the London Metrobulletin in 1983, which Emery launched after buying the printing assets of the London Tribune (which had failed following the departure of Emery and Metz). We’re back; Exclusive interview: the mayor, Al Gleeson; Downtown in 1986: Wow! ; B.I.A. Report: Mall experiment delayed until next year; Eyesores; Crime and punishment: Allan Singer has been taken to court for conducting his business in English; Core area sabotage; Manual for starting a “Community Assoc.”; Random notes; Downtown parking: Plenty of it! ; Random notes on parking; An interview with the President of Alcor Investments: ‘Bullish on downtown’; Letters; Bids to restrict competing businesses decried.